Banning businesses from using temporary replacement workers during a strike or lock-out has been the subject of recurring debate in Ottawa and various provincial capitals. For instance, bans were discussed—but ultimately not proposed—in recent reviews of labour laws in Ontario and Alberta. Currently, only two provinces (B.C. and Quebec) maintain the ban. Proponents of extending the ban to other provinces and federally regulated industries argue that doing so will lead to more peaceful labour relations (i.e. fewer strikes and lockouts). While long strikes can be costly because they disrupt the production of goods and services and the lives of those who are involved, the evidence—which we summarize in a recent study—actually shows the opposite: banning temporary workers leads to more frequent and longer strikes. The reason is that a ban increases the cost of work stoppage for employers and this creates an incentive for unions to more frequently call strikes in order to pressure employers to accept the union’s bargaining position. The ban also encourages striking unions to hold out longer on the presumption that employers would be more inclined to accept the union’s proposals after an extended disruption to operations. Several academic studies have estimated the effect of banning temporary workers on the frequency of strikes. The estimates suggest the ban increases the number of strikes per firm by 33 to 50 per cent. In terms of the effect on strike duration, the estimates point to an increase in the average strike length by 21 to 60 per cent. The dynamics described above partly explain why Quebec and B.C.—again, the only two jurisdictions with a ban—have experienced more labour disruptions than other provinces over the past nine years. The chart below shows the number of working days lost to work stoppages per 1,000 workers from 2008 to 2016, which are the years of available data. 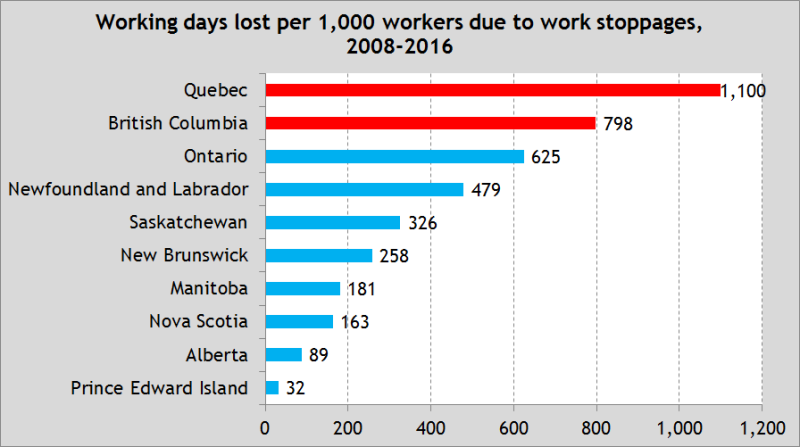 From 2008 to 2016, Quebec lost 1,100 working days (per 1,000 workers) to strikes and lockouts and B.C. lost 798. The next highest rate of lost work days was in Ontario with 625 per 1,000 workers. In other words, the extent of work stoppages in Quebec and British Columbia are more than three-quarters and a quarter higher than in Ontario, respectively. In comparison, the number of lost working days per 1,000 workers in the three lowest provinces are 163 in Nova Scotia, 89 in Alberta, and 32 in Prince Edward Island. Despite the claims from proponents of the ban, prohibiting businesses from using temporary workers actually leads to more disruptive labour relations.